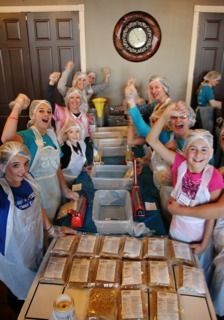 Sunday, October 23, 2011 was a bright sunny day – an Indian summer day – as dozens of children and their parents assembled at 4PM at the Salerno Pincente Ristorante in Hodgkins, Illinois for a meal packaging event hosted by the international charity, Outreach. The children may well have preferred to be playing outdoors, but instead, they chose to volunteer over two hours of their time to package meals for hungry children and their families in nearby communities. It was extraordinary to see nearly 60 children – and 40 adults representing the Flying High Parents Club – working in teams of twelve on production lines to package nutritious meals of pasta and cheese, fortified with vitamins, nutrients, and soy protein. Everyone wore aprons, gloves, and hairnets, and laughed, smiled, and swayed to the dance music that throbbed the private dining room at Salerno’s. Over 15,000 meals were packaged, weighed, heat-sealed, and boxed – and then distributed to local food pantries and soup kitchens. Thank you to all the volunteers and everyone at Salerno Pincente Ristorante.The event was a huge success because of you. Also, a big thank you to Jeff Nolan of Nolan Collaborative for catching all the fun on camera!